In this brave new world of social media, everyone wants to get their service or product into the hands of one. Because you know, if someone who has a lot of followers, a lot of social media clout, says some good things about you or your product or service, it can translate into big business, or at least a lot of eyeballs. But how do you know if someone is really an influencer? Well, you can certainly start by looking at their numbers: how many people follow them on Twitter? How many Facebook fans to they have? Does their blog look like it gets a lot of traffic? Secondly, look at engagement. Does their Facebook page have interactions? Are people responding to their posts, and are they replying? Is their Twitter stream just a broadcast of tweets, or are they engaging in conversations with people via Twitter? Do their blog posts generate comments and retweets and Facebook shares? Up until quite recently, my favorite tool to get a sense of someone’s influence was a cool app developed by HubSpot called Twitter Grader. Not only can you get a sense of your own sphere of influence, but Twitter Grader also offers tips raise your score, and lists of the top (most influential) Twitter users both world-wide and in your own city. There’s a new grading app in town, though, and it’s called Klout. Klout takes your online influence one step further by taking into account your Facebook influence as well as your Twitter, and they have just also moved into LinkedIn. We believe that influence is the ability to drive people to action — “action” might be defined as a reply, a retweet, a comment, or a click. We perform significant testing to ensure that the average click-through rate on links shared is highly correlated with a person’s Klout Score. The 25+ variables used to generate scores for each of these categories are normalized across the whole data set and run through our analytics engine. After the first pass of analytics, we apply a specific weight to each data point. We then run the factors through our machine-learning analysis and calculate the final Klout Score. The final Klout Score is a representation of how successful a person is at engaging their audience and how big of an impact their messages have on people. For its business model, Klout connects people with high scores (or Klout) with brands that want to drive up their visibility by having their brand talked about by influencers. Go to Klout.com to see how you measure up. 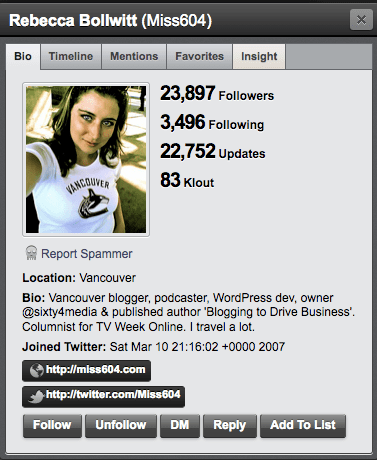 One thing I love about HootSuite is that it allows you to immediately see anyone’s Klout score, which could make it easier for you to decide whether or not you should follow. Social Media Following: is Bigger really Better?